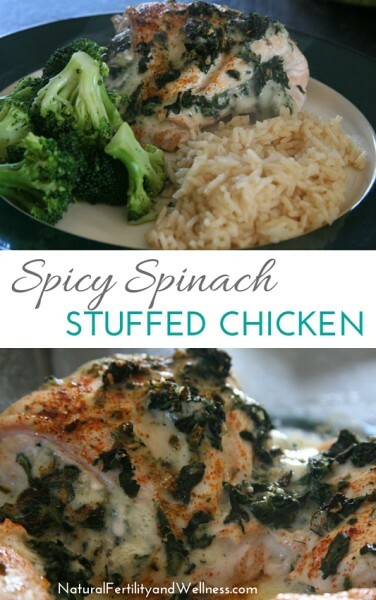 Spicy Spinach Stuffed Chicken - not the same old boring dinner! Adding flavor to food through spices is one of my favorite ways to make my food look and taste better. One of these days I need to get out of my own ‘flavor box’ and try some new things, but for now, we can’t help but love what we love. 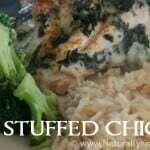 And spicy spinach stuffed chicken is on the list right now! And a bit of spice is a welcome addition. This spicy stuffed chicken recipe is easy to make, tastes great, and it’s very easy to control the spice if you have someone in the family that doesn’t enjoy it as much. Pound down each chicken breast until it's only about 1/4 of an inch high. Combine the cheese, spinach, and salt and pepper in a medium-sized bowl. Place about 1/4 cup of the mixture on to each chicken breast and roll the breast around it, securing with toothpicks. Place in an 8x8 pan, brush with olive oil, and sprinkle the seasoning over the top. I had a bit of the spinach/cheese mixture leftover so I spread that on top too. Bake for 30 - 40 minutes or until chicken is thoroughly cooked. You could also use a nice raw cheddar and stir in an extra teaspoon or two of the seasoning you use into the spinach mixture for extra spice. Taco seasoning can also be used if you don't have cajun spice. Simply pair it with your favorite steamed veggies and either a baked potato, roasted root veggies, or a serving of brown rice. This recipe was adapted from the Cajun Chicken from Cooking Creations. Looks yummy! We’ll have to try it. I make my own taco seasoning with chili powder, cumin, pepper, and garlic salt. It’s really a to-taste thing, but it works as well as store-bought.